A tropical porch pot can add an air of exotic elegance to any entryway, pool deck or backyard patio. But how can you craft a porch pot with a tropical flair even if you live far from the tropics? Because tropical plants are often larger and more colorful than many other plantings, it is often best to choose a pot with a neutral color to avoid distractions that take away from the tropical arrangement. Pots with tropical textures, such as a watery, rattan or wicker look are especially popular. If you do want an extra pop of tropical color, a pot with a bold cobalt blue, teal or turquoise shade evokes thoughts of warm tropical waters, while citrus colors such as orange, yellow or lime green are also popular. Similarly, bright pinks are fun shades for a tropical porch pot. If you prefer a decorated pot, designs that incorporate seashells, palm trees, flamingos or other tropical icons are always fun choices that can give your pot even more flair. The pot should be large and heavy enough to provide a stable base for large tropical plantings. Adding a layer of gravel or stones to the bottom of the pot will help provide that stabilization and improve drainage, which is essential for water-loving tropical plants. Casters or a movable plant stand can also be helpful to move or rotate a heavy container. No matter which plants you choose for a tropical arrangement, it is essential to plant thick, lush layers that will mimic the rich growth of a rain forest. Taller plants should be arranged at the back or center of the pot, depending on how it will be viewed, and vines or trailing plants should be allowed to spill over the pot's edge to showcase their structure and add more sense of lush growth. For even more impact, consider designing several tropical porch pots of different heights and sizes to group together into a larger focal point that will create an oasis-like feel. 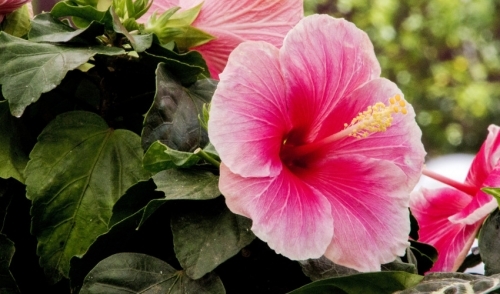 Tropical plants require specialized care to stay vibrant and show off their best qualities. When choosing plants and planting containers, keep plants with similar watering and sunlight needs in the same pot to make care easier. Well-draining soil and a pot with proper drainage is a must to keep roots from getting waterlogged, as these plants will feel most at home with ample water but soaked roots can rot quickly. Extra fertilization may be needed for pots with a long lifespan, as the water these pots require will leach nutrients out of the soil more quickly. Tropical plants also do their best with plentiful sunlight, so a pot that can be easily moved or rotated to increase the plants' exposure to the sun is helpful. Of course, tropical plants also need proper protection from chillier temperatures, particularly in northern areas, but a healthy pot can easily be moved indoors or otherwise sheltered from a cold snap if needed. A tropical porch pot can be a stunning statement for any entryway or outdoor space. The further you are from the tropics the more outstanding that statement may be, and with proper planning and care, even northern locations can enjoy a touch of the tropics with a porch pot.